This mod requires Crafttweaker and BASE to run. ContentTweaker is an addon for CraftTweaker. Crafttweaker lets you adjust recipes, remove them entirely, or add new recipes. 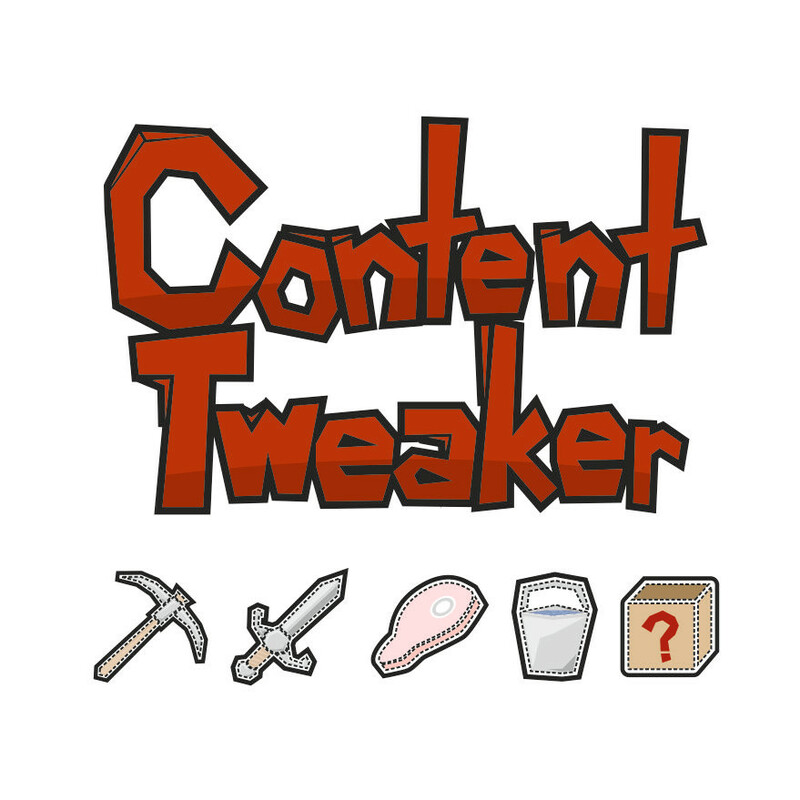 One of the features that it lacks is the ability to create new items and blocks, ContentTweaker plans on allowing users to add more to their game, not only recipes but actual items and blocks. Using a Zenscript Syntax you can create new items and blocks to the game rather simply. These blocks are treated the same way as any other standard block, and thus requires a model(Supports .obj)/texture JSON and a texture. You'll find appropriate directories in the ACRONYM/ContentTweaker sub-folder in your config directory. More information on how to create your blocks and how to handle resources will be available on our GitHub wiki and hopefully soon on the official MineTweaker web page! Want to do a mod spotlight? Would be awesome! Send us a link so we can check it out! You have our permission to use this mod in any private & publicly distributed mod pack. I picked up ContentTweaker for the soul purpose of removing the lumber axe from Tinker's Constructs. I see lots of adding, and altering items. How would I remove ALL lumber axe's form being able to be crafted? Would it be possible to get an update on the documentation, block documentation is completely missing, and the fluid documentation was actually quite confusing to read and could use more explanation. I am rather adept at using mine/mod/craftTweaker scripts, and this one just confused me when it came to understanding what did what. I eventually gave up and modded in the needed items the old fashioned way. Quick question: what are the ToolTypeString available? is there a list of all possible entry available for each field? I want to make matches, so I need a "flint and steel" with only 1 durability, set things on fire, if possible custom sound on breaking. Guys, I found an example. It's from the technofirma modpack. The server files were on github, so I found these and they work. I've had trouble getting blocks to work, but items work just fine. All credit goes to dexman545, the creator of technofirma, according to the github website. The documentation is kinda Garbage, so Im using what you posted below and your "example" linked from the wiki. This is pretty annoying to work out. I used your written example that you posted and it still doesnt work. "It works for me" isnt really valid. I have the latest of the latest installed for Mine & Modtweaker, Tcon, and this. Ah well, worth a try using. The documentation in the wiki is up to standard on for info on the Minetweaker wiki. The documentation is still missing entirely for blocks. The Wiki entry for registering a block seems to be missing, can you give an example please? You need to put rock in quotes, like "rock"
Where are you putting the script? What exactly does the materialID call? Is it an ID for the constituent item or some value that TCon itself calls to organise the list of usable materials? Trying to add Seared Brick as a material. It is a tcon material id, an internal id, Tcon uses 0-45 so I would suggest starting at 50 to be safe. Can I use this in my modpack, "DWYW"? Is it possible to do multi-texture blocks? Can you set properties like falling (like sand/gravel) or light (like glowstone)? You cannot do multi-texture blocks, it would be too complex. Making a block fall is difficult in this instance, I will look into it. Sorry, I'm just a little confused on adding blocks. Then I go and add a script of with: mods.content.dirtbrick ?